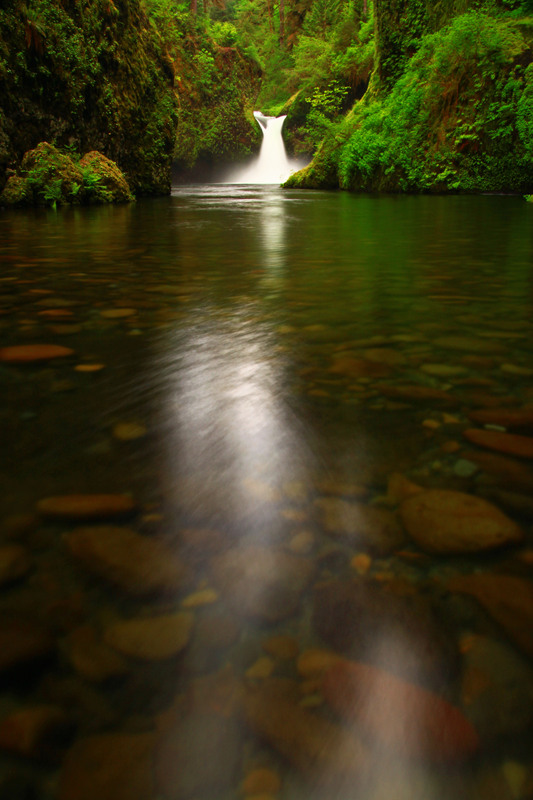 Beautiful photo of Oneonta Falls and bridge in the Columbia River Gorge, Oregon. This particular trail will take you to four spectacular waterfalls and provide you some of the most awesome views of the Columbia River as well as views of the thick forest and lava cut gorge. One of the best hiking destinations is above Triple Falls and if you continue past the falls, you can expect to hike alongside the creek that feeds the waterfalls. There are thousands of photo opportunities and if you’re up to a really long and strenuous hike, you can continue for another 7.7 mile to reach Multnomah Falls. On this particular hike, to Triple Falls, I was sadly turned away due to the fact that there was a mud slide that took out a portion of the trail just a few hundred feet from the waterfall. The forest service was working on the trail but it was a mud soaked mess and I wasn’t interested in slogging through three feet of mud. The trail was still open and passable but it was pretty muddy and you can expect to endure a very muddy mess for at least another month before it dries out. I decided to turn back and head towards Oneonta Falls to see if I could get some descent shots. The switchback that continues past the bridge was also damaged, so you can expect to get pretty muddy as well. However, if you park on the other side of Horsetail Falls parking lot, you can come in from the west and avoid the muddy part of the trail. Because the snow in the mountains are melting and with all of the rain that we have received lately, you can expect the waterfalls to be at their peak. The water is thundering through the gorge and you will find yourself immersed in fresh water chaos. The vegetation is at it’s peak and the rivers, streams and creeks are swollen to their brim. Now is the absolute best time to visit the gorge, if you want to see the gorge at its best as well as having the best opportunities to get some great shots. To get this shot, I made sure to use my tripod, bubble level and remote switch. I was using my Sigma 17-70mm lens and attached my CIR-PL and warming filter. I set the camera mode to shutter priority and set it at 2.5 seconds in order to get the flowing motion of the waterfall. The water was moving so fast that I never set the shutter priority past four seconds all day. The waterfalls were literally moving at light speed and anything over four seconds washed out the water. I set the ISO at 100, white balance at -1.3 and the aperture was at F-4. The skies were completely overcast and it was sprinkling all day. However, since the water was moving so fast, it caused the pictures to become too bright, so I had to reduce the white balance to offset the highlights. If you have a descent telephoto lens you can get some great opportunities to get some shots of the raptors flying around the gorge. While hiking near the main trail I saw two juvenile bald eagles jump from their perch and start hovering just above where I was standing. I also saw several bald eagles and osprey flying near the Columbia River gorge. The gorge is a raptor gold mine due to all of the fish in the river. If you have the patience, you can expect to get some great photos of them. One of the most majestic and massive waterfalls that I’ve seen in a long time. It isn’t nearly as tall as Multnomah Falls but this 3-tiered cascade starts with a hidden 50-foot falls, spreads across a 70-foot fan and finally drops 80 feet into a huge rock punchbowl. However, the last part of the waterfall isn’t within view due to the trees and the sheer drop next to the falls. The waterfall is so wide towards the top that you could park a semi from end to end and still not block the falls. The trail starts at about 15 miles north of Carson, WA at a primitive and quiet parking area. The last few miles are on a gravel/dirt road with some potholes. The best part of this hike isn’t just to the waterfall. If you backtrack about 1/2 mile there is another trail that takes you to the top of the falls. This puts you at 2370′ and right on top of the falls. There are several viewing areas at this elevation and the panoramic views are incredible. The forest is also especially beautiful and quiet. There is also another great little creek that flows down just before the main falls that a bridge crosses. I’m pretty sure that it’s a natural spring since the upper trail never crosses this same creek and it doesn’t seem like it forks from Falls Creek. This photo was taken at about 12.22 in the afternoon. I returned to the falls for a second time in order to avoid most of the glare from earlier in the morning. To get this shot I used my 17-77mm lens. I set the focal length at 55mm. I had my warming filter and CIR-PL attached to the lens. I set the ISO at 100 and the F-stop was at 22. I set the Exposure Program to Shutter Priority and set it at 1.2 seconds. I used my tripod in order to avoid camera shake. There is a good chance that you may run in to a black bear, elk or deer since the forest gets pretty thick once you hike above the falls. You may even spot an eagle, osprey, hawk or turkey vulture soaring high above the forest. Since the hike itself is pretty easy and short, you may want to locate some other hiking trails in the area if you want to spend the whole day hiking. 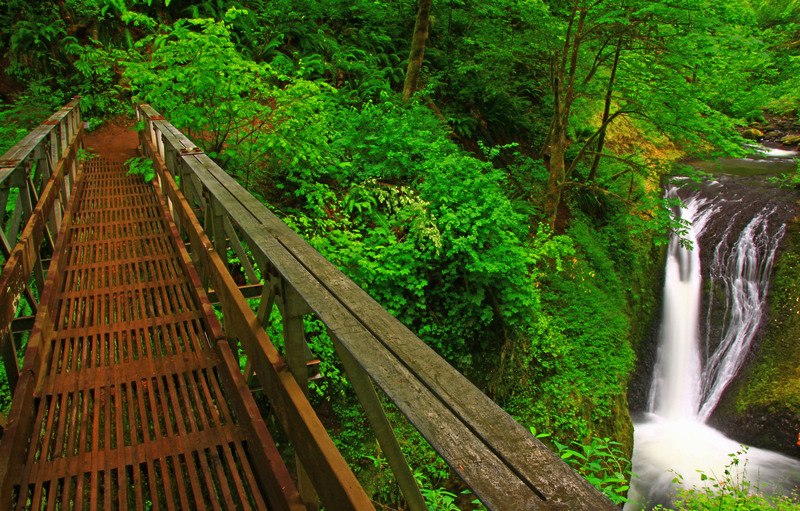 The trail that leads to triple falls is one of the most scenic and spectacular trails in the Gorge. 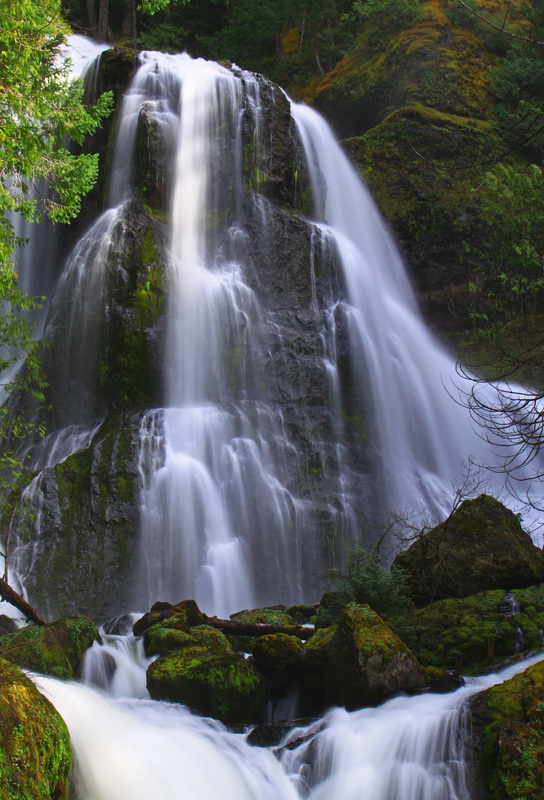 The trail leads you past four beautiful and very photogenic waterfalls, unbelievable views of the gorge and the Columbia River, old growth forest and parallels the creek that feeds the waterfalls. The best time to visit is between May and early July. This is the best time to catch the creeks at their highest level and the foliage is usually in full bloom. The wildflowers are also spectacular and some of the most widespread in the Pacific Northwest. However, since the weather can be unpredictable, sometimes the foliage can stay dormant well into June depending on the temperatures during spring. The photo that I posted is the most popular viewing area of the waterfall and you can really see just how awesome this part of the gorge really is. The creek climbs several miles past Triple Falls and the trail parallels the creek and offers millions of photo opportunities. I may sound bias but this part of the Pacific Northwest makes any other parts of the world look like a desert. To get this shot I made sure to use my tripod, bubble level and remote switch. The viewing area is a very uneven and steep cliff so setting up your tripod can be tricky and only one person at a time can take this photo since it’s so narrow. I set the camera mode at shutter priority and set the shutter speed at 4 seconds. The aperture was at F-18, the ISO was at 100 and I adjusted the white balance to -0.7. I was using my Sigma 17-70mm lens and set the focal length at 17mm in order to get the most panoramic view as possible, without having any vignetting. The day was mostly overcast and the sun was directly behind the waterfall. It was about 12:22pm but since the clouds were moving so fast I just waited for the best opportunity. If you plan on visiting and expect to get a photo of triple falls, without having dozens of people sitting along the waterfall, you may want to come during a weekday and a very overcast or rainy day since hikers like to sit just above the waterfall and take pictures. I was pretty fortunate to only have to wait for two hikers to eventually move away from the area before I could get to work. the elevation gain to triple falls is only about 600 feet but you could continue all the way to larch mountain if you’re up to the 6.5 mile hike. This is one hike that you will truly be glad you took and you can expect some of the most fantastic views of your life. Unless you plan on wading out in a foot of frigid water to get this type of shot, I wouldn’t plan on making the trek until the water level starts to drop. The water level is so high that the rocky beach is almost completely underwater. I have never seen the water level in the gorge this high since I started hiking the gorge over 20 years ago. As you can see from this photo, Punchbowl Falls is beyond swelled. In order for me to get this shot I had to take off my socks and shoes and wade out in about a foot of water before I could get a clear shot. The water is moving pretty fast so you need to steady your tripod as firmly as possible and hope that it doesn’t move. In case I did lose my footing and found myself swimming in the frigid creek I made sure to leave my photography bag, with all of my other lenses, at the safety of the creeks edge. The creek was so cold that after about 30 minutes I completely lost feeling in both of my legs from the knees down. The pebbles and rocks that you are forced to stand on are pretty jagged and hard but once my feet became numb I lost all feeling and was forced to rely on my tripod to steady myself as I scrambled back to the edge. Next time I will bring my Teva’s so I don’t have this problem again. Though the vegetation is starting to spring there are still several plants that still haven’t bloomed as well as several of the old growth trees that have only just begun to show their buds. This created a challenge since I wanted to take advantage of the swelling creeks and waterfalls but not include any of the shots with the bare vegetation. The harsh winter and cool and rainy spring has really made it tough on the gorge this year. The wildflowers are even somewhat confused. Several of the flowers are growing along the high cliffs but most of the wildflowers that grow along the creeks are barely out. I chose this shot in order to show just how much water was thundering over the falls as well as ensure there were no bare branches. I was using my Canon T1i along with my Sigma 17-70mm lens. I made sure to use my tripod, bubble level and remote switch in order to avoid any camera shake. This was especially difficult since the tripod was in the middle of the fast moving creek. I attached my ND8, warming filter and CIR-PL so I could have the camera in Shutter Priority mode. The focal length was at 21mm and I had the shutter open for 5 seconds. The aperture was at F-13 and I set the ISO to 100 and the white balance at -0.7. I spent about 45 minutes in the creek so I had plenty of time to adjust the focal length and the shutter speed and white balance but I was forced to basically just adjust and shoot as quickly as possible. The morning and afternoon was overcast so the sky was perfectly covered and it never even tried to rain. The trees should start blooming within the next week so I hope that my next trip here will offer more color but still plenty of water. [/caption] Spring offers the best time to head out the Columbia River Gorge in order to capture the waterfalls and foliage at their best. With all of the waterfalls and vegetation, you can find yourself losing track of time and immersing yourself in it’s splendor. However, you will want to make sure to bring your tripod, remote switch, additional batteries, extra memory cards and as many ND filters that you can carry. It’s not hard to run out of memory cards or battery life since I’ve been able to set the shutter speed as long as 30 seconds during broad daylight and only to find that I run out of battery life before it’s time for dinner. There are also thousands or millions of photo opportunities above the waterfalls, since this is where you will find the smaller and slower paced creeks and streams burrowing through the foliage and basalt rocks. There are endless amounts of smaller waterfalls and hidden pools just asking to be photographed. You will literally be consumed by the sheer magnitude of photographic opportunities. [/caption] Only 12 more weeks until waterfall season starts in the Pacific Northwest. It’s almost time to dust off your ND filters, clean your camera sensor from any dust or water droplets, locate your bubble level, remote switch and tripod. Even though the season can begin in late June or even sometimes early July, May can offer some great opportunities if the foliage starts to bloom early. The water volume is also way more amazing, which can sometimes help you overlook the still dormant vegetation. The Pacific Northwest offers several weeks of abundant overcast days with lots of partly sunny skies that help you create the perfect setting. You just want to make sure and pack your best waterfall lens and try to keep it as dry as possible. I use my Sigma 17-70mm lens and attach my UV, warming, ND4 and sometimes my CIR-PL filter. Depending on the lightness of the scene, I will usually remove the CIR-PL and attach my ND4 filter but if there is enough light and I want to increase the shutter priority above 10 seconds, I will attach both since I don’t have an ND6 or greater. However, I will sometimes adjust the ISO and white balance in order to get the best shot. [/caption] Another iconic but little known waterfall high above Multnomah Falls! It’s official! July temperatures in Oregon have reached the 80 degree mark just like clockwork. Every summer the temperatures reach into the 80’s and unfortunately if you were hoping to get great photos of the lush and green Columbia River gorge time may just have run out. Once the hot temperatures reach into the gorge, the foliage begins to stress and wilt and the spring run off becomes much less predominant. In many of the creeks it becomes nothing more than a trickle and even some of the waterfalls dry up. However, there are hundreds of swimming holes that are ideal to cool off from the heat. 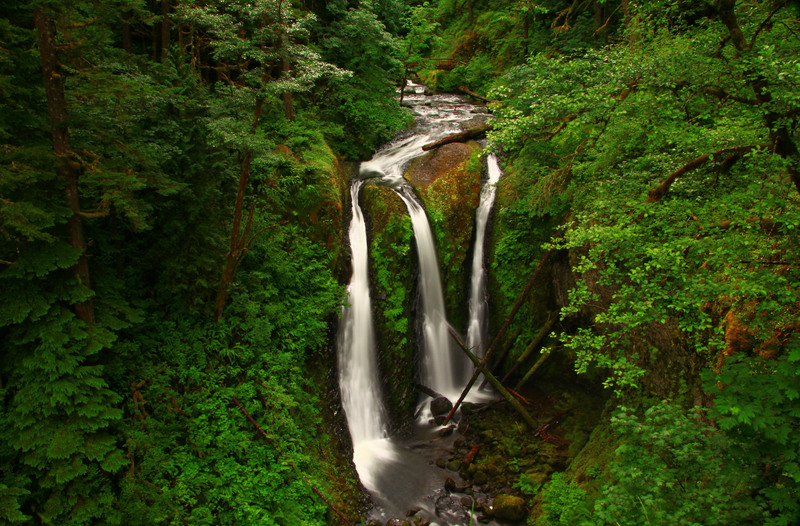 [/caption] The Upper McCord Creek waterfall is located just above Elowah Falls. The trail scrambles up a fairly steep part of the gorge and is located directly above Elowah falls, which is fed by the same creek. The elevation gain is about 620 feet and the top of the trail was dynamited in order to allow hikers to access the falls. There are steel handrails that prevent hikers from falling to their death but there are still some areas where the handrails aren’t located and the drops are just as dangerous. The view from the top is amazing with bald eagles, osprey and turkey vulture’s soaring just below. Very few people know about this hike and most of the people that do decide to hike here usually hike to Elowah falls rather than make the steep ascent to the top of the cliffs. The hike starts at Yeon park and there are no facilities and only limited parking. The best view of the waterfall is right off the main trail and there are a few amazing spots to set up your tripod. It almost like the forest intentionality set up the spots for photographers to camp out. Above the waterfall is McCord creek and you can see it winding through the forest as it disappears in the distance. To get this shot I made sure to use my tripod in order to avoid any camera shake or blur. I attached my warming filter, ND4 and CIR-PL. I made sure to turn off the OS on my Sigma 17-70mm lens and set the focal length at 21mm. I had the camera mode in shutter priority and set the shutter speed at 2 seconds. I set the ISO at 100 and the white balance at -0.7 which made the aperture automatically set at F-10. It was about 3:50pm when I took this photo and the sun was well hidden behind the forest and cliffs. There are several wildflowers along the trail so you may want to bring along your macro/prime lens as well. I wanted to completely frame the waterfall with the neon green vegetation surrounding it and this photo pretty much shows that. [/caption] You can visit an awesome waterfall just above the ultra busy Multnomah Falls area and enjoy some peace and quiet as you enjoy an incredible waterfall. The same creek that feeds Multnomah Falls offers a hikers and photographers paradise. Thousands of tourists invade the Multnomah Falls area and usually stop at the the bridge or the viewing platform above the falls. However, the best part of the trek starts as you wind yourself up into the gorge and immerse yourself in the smaller and more quaint waterfalls. You could continue the trail all the way up to Larch mountain if your brave enough to include an additional 6 miles and 3500 foot of elevation gain to your day. However, the most scenic part of the hiking trail is just 3/4 of a mile above Multnomah Falls. You will still find yourself hiking alongside many of the tourists but there numbers are only a fraction of the tourists at the lodge. This particular waterfall doesn’t have a name but is one of the many very photogenic waterfalls in the Columbia River Gorge. You can get alongside the creek if you hike just a few yards below the main trail and wait for the best possible opportunity. There isn’t a lot of room to move around so most of the hikers continue along the trail while some do hike down to the creeks edge. However, there is ample room to set up your tripod. The waterfall is about 150 feet tall and splashes into a massive basalt cavern that eventually opens up to form the lower canyon that the creek flows through. I was standing about 100 yards from the waterfall and the massive object to the left of the photo is an old tree trunk that has been sitting there for so long that many trees and plants have taken root. The stump is only about 5 feet from where I was standing and since I wanted to maintain a good field of view I made sure to keep the focal length at the right distance. This way I was able to make sure the entire photo was in focus even though the tree stump was five feet away, the waterfall was 100 yards and the trees behind the waterfall were several hundred yards away. I found that having a focal length of 21mm still allowed me to have the correct focal length to frame as much of the scenery as I could. I was using my Sigma 17-70mm lens and made sure to attach my warming, ND4 and CIR-PL filter in order to use the shutter priority. I set the shutter speed at 4 seconds and the aperture was at F-13. I set the ISO at 100 and the white balance at -1. I took the photo at about 12:40pm and the sun was directly behind the waterfall. Fortunately, the sky was overcast with only fragments of the sun able to shine through the clouds. I made sure to use my tripod and bubble level in order to avoid any camera shake. I also made sure to turn off the OS on the lens. Now is the time to visit the gorge since there are only a few more days until the warmer temperatures and sunny skies take over and the gorge loses it’s high water levels and the vegetation starts to lose their neon colors. [/caption] This isn’t exactly the most masculine name for a waterfall but I guess you could imagine this waterfall being created by a fairy. The waterfall itself is a very photogenic waterfall and there are several different photographic opportunities. I usually zoom into the waterfall and capture the water cascading down and over the step like basalt rocks. I can literally visualize myself climbing up the entire waterfall like a staircase. The waterfall is located directly on the main hiking trail that climbs along the gorge. The waterfall is about a 1.5 mile hike and the entire hike is somewhat steep with about 700 feet of elevation gain from the main trail. To get this shot I made sure to use my tripod, bubble level and remote switch. I had the camera mode in Shutter Priority and set the shutter speed at 4 seconds. The sky was completely overcast but the sun was directly behind the waterfall which caused the water and foliage to give off great colors. I attached the warming, ND4 and CIR-PL in order to allow me to set the shutter speed at 4 seconds. The aperture was set at F-8 and I set the ISO at 100 and reduced the white balance to -0.3. I was standing about 8 feet from the waterfall and I had the focal length at 21mm in order to frame the entire waterfall in the photo as well as include some of the foliage and logs in the foreground.